from exploding watermelons to performers rapelling down silos." tangle of lovely bodies in 'The Womb', my faith in empirical, exterior theater restored." Organism was a system of collaboration involving webs of phenomena cast by 120 artists, musicians, performers, technicians and at least one historian. 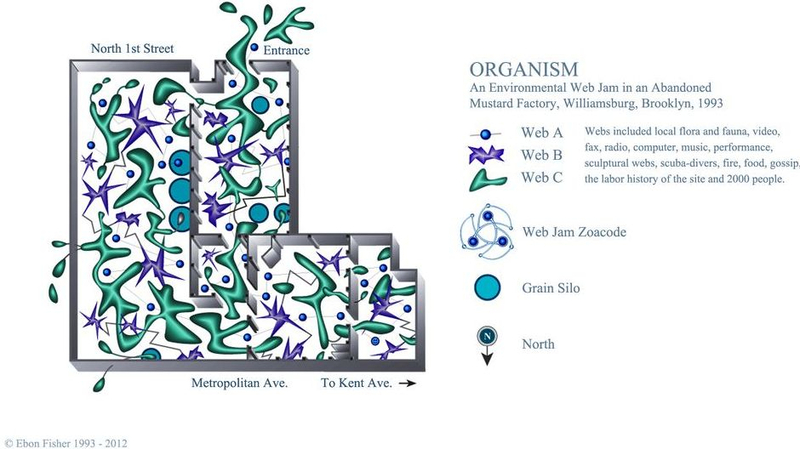 The all-night, ecological event took place in an abandoned mustard factory on Metropolitan Avenue in Williamsburg, Brooklyn in 1993. Ebon Fisher's proposal for the event outlined a method of simultaneous and overlapping arts presentation he dubbed a Web Jam. Participants cast webs of performance, video, music and sculpture across a 10,000 square foot industrial site. 2000 people attended, dancing and strolling about from six at night until 9 the next morning. as living event, breathing and transforming for fifteen hours in an abandoned mustard factory." Organism could not have succeeded without the skills of a community of artists and musicians who had cultivated a highly collaborative, Immersionist sensibility among the storefronts, streets and warehouses of Williamsburg, Brooklyn, in the early 1990s. Primary organizers included Ebon Fisher, Anna Hurwitz, Megan Raddant, David Brody, Colin Crain, Richard Duckworth, Robert Elmes, Jeff Gompertz, Yvette Helin, Jessica Nissen, Kevin Pyle, Fred Valentine and Dan McKereghan. See all 120 collaborators below. "[Organism] has such a following that even Newsweek wrote about it. Events like these finally established Williamsburg as an artists' colony." "The linear quality of the written word cannot describe the experience of being there within the ORGANISM, undulating." "The energy of the show was huge, unique, on the edge of containment, and yet full of good spirit, rare spirit. And it had shape, crisp sensations of expectation, happening, and climax, and afterward a kind of post-organismic cigarette was lit and for me it's still smoking." Karen Cormier and two unidentified participants. The Web Jam was essentially an enclosed urban jungle. Melanie Roche's Dancers criss-crossed over and interacted with Megan Raddant's Elvin Napping Systems, which criss-crossed over lines of David Brody's video and computer systems. Roaming musicians such as Karen Cormier's wolf balladeer comingled with Hit and Run Theater's rapellers who dropped down from large grain silos and streamed through the audience on the way to scuba diving in a tank at the other end of the factory yards. Myk Henry tempted the audience to light numerous fuses which sparkled in the darkness and ignited cherry bombs at the center of watermelons dangling from the factory ceiling. Flying pieces of watermelon created another web reaching as far as North 1st Street. 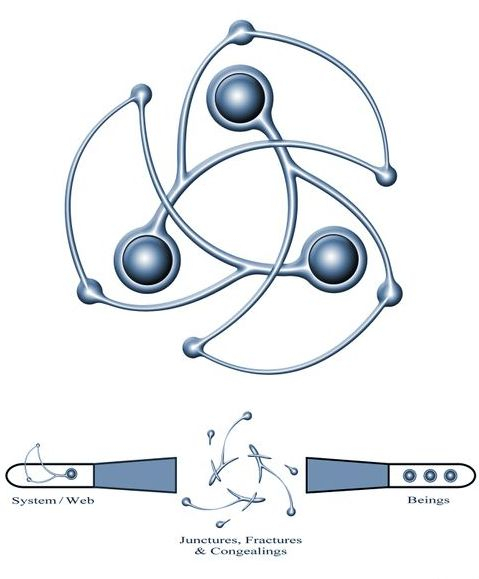 Systems were not strictly of an arts variety. Gene Pool provided a formula for seeding odd pockets of rye grass throughout the site, overlapping Sasha Noe's extreme bottle smashing and recycling system. Pegi Vail installed small lights throughout the site which pin-pointed features of the factory's history. A phone line was installed so that WFMU could provide a live broadcast of the event. Fax messages came in from the West Coast. The Web Jam was ultimately an emergent living system, offering a vivid departure from both modern and post-modern theories of cultural production. spawn unique accidental places "
Organism was the last of Williamsburg's great warehouse events which included the Cats Head I & II and Flytrap. In the mid 1990s onwards, as real estate speculators began to exploit the pioneering nerve of Williamsburg's creative community, fire departments began to shut down such large experimental gatherings. Fences and private condos went up around the waterfront. 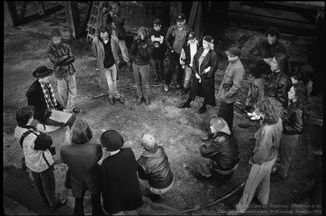 The Outpost, Shlomo Mantz, Rick Culver, Bill Cuozzi, the liquid crew, the security crew, and Circle Arts.